The Analyser may statically check the current diagram for certain syntactical and structural deficiencies. Which of the available checks are to be performed is configurable (see below). The analysis is done at live time (i.e. during editing) and reports detected potential problems in the report area below the diagram work area. To enable or disable the static Analyser as a whole you may use menu item "Diagram => Analyse structogram?" or simply press <F3> (see Settings > Analyse structogram?). In the Analyser Preferences you may opt in or out any of the individual rules available for the analysis. See Analyser Preferences for a list and a short explanation of the rules. When you see warnings in the report area, just click on one of the report lines to select and highlight the corresponding element in the diagram. In the above example, you see three detected problems in the Analyser report area. 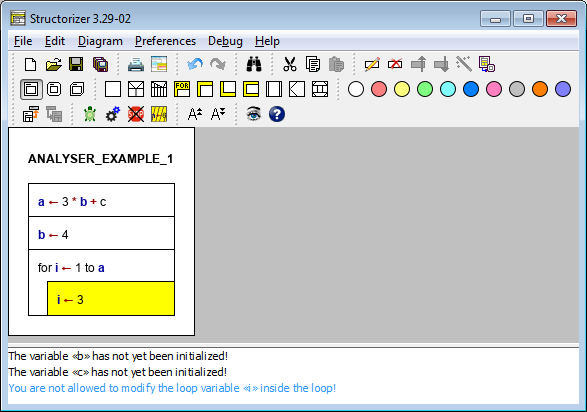 The first two of the messages refer to instruction 1: In the expression variable b is used, but its initialization hasn't been performed yet, it's following in an instruction executed later. For identifier c in the same expression no initialization at all could be found anywhere (c is not bold in the diagram, therefore). The responsible rule for this kind of analysis is "Check for non-initialized variables". This rule also checks for variables the initialization of which may not necessarily be reached, e.g. because it is placed in a branch of an alternative or whithin a loop. Such cases are reported with a slightly differing message. The third of the messages relates to the body of the FOR loop where a manipulation of the control variable i is tried, which is usally regarded as illegal (though some programming languages like C or Java allow such questionable ways to control the loop, e.g. to leave it prematurely; you may see them used even frequently). The responsible Analyser rule is "Check for modified loop variable". Likewise, loops where the body has no obvious influence on the loop condition (such that an accidential endless loop may be supposed) may be detected via a different rule etc. Note: Besides static analysis you may also perform runtime analysis, which is a separate feature of the Executor. For more details see Guided Tours / Tutoring.